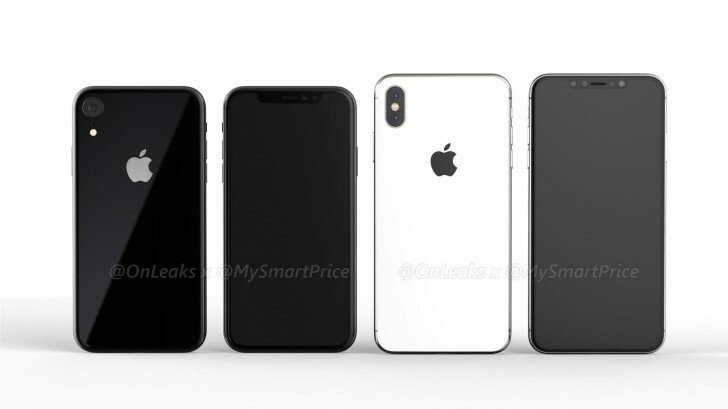 OnLeaks released some crisp renders yesterday of what is supposed to be the budget iPhone with 6.1-inch IPS LCD display. Today, we have a fresh new batch of the 6.5-inch variant, which leaves only one more to go - the compact 5.8-inch model. Anyway, let's focus on what we've got for now. The 6.5-inch model is reportedly coming with an OLED panel and will start a new iPhone X Plus lineup of some sort. The notched design is here to stay along with the metal frame, nearly bezel-less display and the vertically-stacked dual camera setup on the back. The camera modules are bulging just a little - similarly to the current iPhone X and the notch houses all the needed sensors for the Face ID feature along with the earpiece and the front-facing shooter. The rumored dimensions are 157.5×77.4×7.7mm, and once again, the fingerprint is nowhere to be found. Here's a bonus image with the budget 6.1-inch iPhone and the plus-sized model stacked side by side and a video to go along. Dell Streak was first, but Sammy nailed it with the Note. Man big screen i think it was Samsung with their Note series.